If you’re visiting the Boston area, chances are that you want to get a taste of the Atlantic Ocean while in town. One way to do just that is to head out to the Boston Harbor Islands National Park, which consists of 34 islands and mainland parks. Of the islands, there are three that are closed to the public, 19 that can be reached by private boat and eight that are accessible to the public via the Boston Harbor Islands Ferries. The eight islands the public can visit by the Boston Harbor Islands Ferry are Georges, Spectacle, Peddocks, Lovells, Little Brewster, Grape, Bumpkin and Thompson Islands. Georges Island, a 50-minute ferry ride from Long Wharf, is the most popular of the islands, as it is home to the historical Fort Warren from the Civil War era and a great spot for picnicking. Spectacle Island is 20 minutes from Boston and a spot that people will visit for hiking, boating and swimming, especially since there are lifeguards during the summer months along the beach. There are also beautiful views of the city from the tallest hill on the Boston Harbor. Peddocks Island is the largest island with camping, Little Brewster is where you’ll find the Boston Light and Lovells Island also has camping and a nice beach. Last but not least, Grape, Bumpkin and Thompson Islands all have their share of activities such as camping, hiking and historic and educational sights. You can pick up the public ferry to the Boston Harbor Islands from two locations: Long Wharf North in Boston and just south of the city at the Hingham Shipyard in Hingham. Both locations are easily accessible by public transportation and have nearby parking. From Long Wharf, located at 66 Long Wharf next to Christopher Columbus Park, take the Boston Harbor Islands Ferry to Georges and Spectacle Islands. You can also transfer at Georges Island to continue on to Peddocks, Bumpkin, Grape and Lovells Islands. The ferry departing from the Hingham Shipyard, located at 28 Shipyard Drive in Hingham, will bring you to Georges, Bumpkin, Grape, Peddocks and Lovells Islands. These ferries are operated by the MBTA, Boston’s public transportation service, and ticket prices differ from the ferries departing from Long Wharf. These ferries are also first come, first served, so make sure you plan accordingly. If you’re camping, pick up a free parking pass before you get on the boat. To access Thompson Island, which is open to the public during select summer weekend days, take the private ferry service from the EDIC Pier in South Boston. Tickets for the Boston Harbor Islands Ferries departing from Long Wharf can be purchased in advance at bostonharborcruises.com or by calling 617-227-4321. If you prefer to wing it, you can also get them at the Long Wharf ticket stand. Tickets for ferries departing from the Hingham Shipyard are provided by the MBTA and can be purchased at the ferry center. Each summer, there are select Free Ferry Days when you can experience Georges and Spectacle Island from Long Wharf North in Boston at no cost. Check out this year’s dates and plan accordingly. 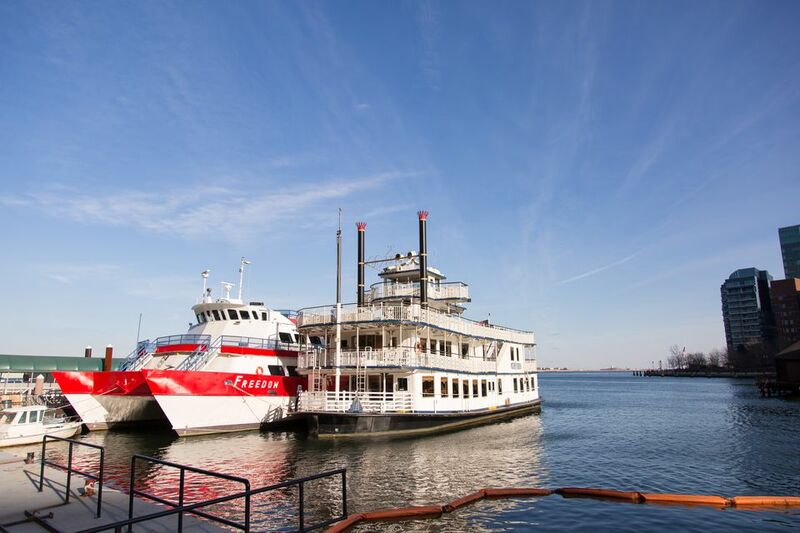 The Boston Harbor Island Ferries run from May-October and exact schedules depend on the locations and time of year. Visit bostonharborislands.org/ferryschedule for more details before you plan your trip, as schedules are subject to change. Boston to Georges Island: 7 days a week, departing Boston at 10 a.m., 12 p.m., 2 p.m. and 4 p.m.
Boston to Spectacle Island: Weekends only, departing Boston at 11 a.m., 1 p.m. and 3 p.m.
Boston to Georges Island: Weekdays departing Boston at 10 a.m., 12 p.m., 2 p.m. and 4 p.m.; Weekends departing Boston on the hour from 10 a.m. to 4 p.m.
Boston to Spectacle Island: 7 days a week, departing Boston at 9 a.m., 10:30 a.m., 12:30 p.m., 2:30 p.m. and 4:30 p.m.
Hingham to Georges Island: Weekdays from Hingham at 10 a.m. and 12 p.m.; Weekends from Hingham at 9 a.m., 10 a.m., 11 a.m., 1 p.m. and 3 p.m.
Hingham to Bumpkin, Grape, Peddocks, Georges and Lovells Islands Loop: Friday, Saturday and Sunday only, departing Hingham at 8:45 a.m., 10:20 a.m., 2:05 p.m. and 3:40 p.m.; last arrival back in Hingham is at 6:05 p.m. Regular public restrooms can be found on Georges, Spectacle and Peddocks Islands. A couple of the other islands have composting restrooms, but plan accordingly, as others do not have anything.